Join us for an 8-day programme where Daniele and Marco will explore Patanjali’s Yoga Sutra through yoga practice and dialogue. Yoga Sutra was the first-ever written document entirely dedicated to yoga, and has been used as the main reference point for a great number of schools and traditions throughout the centuries. It is based on a deep understanding and exploration of human nature, the Yoga Sutra gives us clear directions on our journey to Self. Through physical movement and breathing techniques, we are invited to discover a new layer of consciousness that goes beyond mental perception - one that transcends the ‘I’ and ‘Me’ of our rational brains to a deeper and more open sense of awareness. Meanwhile, through dialogue and discussions we will explore the pragmatic nature of yoga philosophy and the spiritual essence of yoga practice. Daniele Rabozzi has practiced yoga since 1981. Among the various schools he has attended and traditions he has explored, he was most taken by Raja Yoga, as taught by the students of Gerard Blitz and the Yoga Shivaita of the Kashmir region, as taught by Eric Baret. His first trip to India in the late 1980s led to series of experiences and relationships that have made the country his second home. 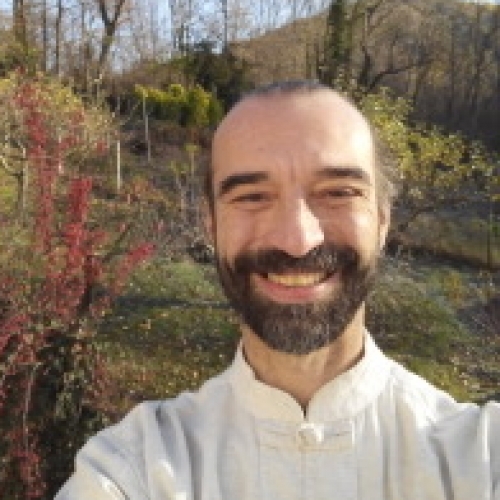 Out of these encounters came a meeting and friendship with the Indian sage Vimala Thakar, which Daniele describes as the most influential experience of both his practice and his life. The intensity of Vimala’s teaching alongside his presence helped Daniele to gain an entirely new perspective on yoga and took his practice way beyond the confines of the mat. He then went on to teach at the Centro Studi Yoga Kailash in Verbania where, together with his wife Anna Cantarelli, he runs courses, seminars, conferences and cultural events. He has led residential retreats and seminars in Italy and India for many years, and is a member of YANI (the Italian National Yoga Teachers Association) of which he was a member of the executive committee from 2009 to 2015.